Cozie Blog » Blog Archive » Squeek! by coie - January 28th, 2008. On Thursday night I was at work, bored as could be. And tired. I had been braindead all day, but that’s really nothing new for me and my co-workers treated me like normal. Two of them were changing one of the endcap displays which was now going to hold a plastic 5-shelf storage unit. My "supervisor" told me to put one together while they put in shelves and safety restraints on the actual endcap. I warned them that it wasn’t a good idea, but they didn’t listen. So after giving myself a papercut while opening the package, I realized that this wonderful thing just snapped together. So I started snapping in legs and then snapping in the shelves until I worked my way up this large tower. I had some trouble with the top one since it was about a foot taller than me, but after about 20 minutes (I had customers in between) I completed my task and gloried in it. I pulled it over to M and B and proudly announced that it was done. B started laughing. I demanded to know what was so humorous, and he said, "Look at the shelf and tell me what’s wrong with it." I just started giggling. The very bottom shelf was put in upside down. So after being humbled, I went back to my register and was bored again. My co-worker and friend, V, came over to talk to me and then she looked behind me, squealed, and did a little dance. I knew this meant mouse. I’m not really sure why all the females at my work are afraid of cute little mice, but they are. So I turned around and looked. Then she squeaked out, "Oh! There’s TWO OF THEM!!!" They were 30 feet from us, but apparently she still thought us in grave danger. C, at the service desk, asked her what her problem was, and she eventually just ran back to self checkout where she thought herself safe. Later on, B came back over and heard about the mice. He saw three at this point and asked me if I wanted to help him catch them. So I did. My job was to make sure they couldn’t get pass certain points and he was going to do the catching with some cardboard box things. The only problem with this was that every time a mouse ran near him, he yelled, jumped up and darted a ways off. To make a long story short, I caught the first one, live. The second we had squashed accidentally behind a sign, and the third one B squashed when the slammed the box down. He sorta landed it halfway down the body. We had two dead and one live mouse. What to do with them? I suggested flushing them down the toilet but everyone thought that was a cruel thing to do to a live mouse. But if we let it outside it would just come back in. Oh yes, by this point, B had named the thing Herman. So I did what any other sensible girl would do. I offered to take him home. After all, I live in the country. I would show my siblings, and then let him loose or give him to the cat. So we put Herman into a box and poked holes in it. We labeled it, "*Herman* Do NOT throw away!" and left it at the service desk. When I left, everyone made sure that I didn’t forget him. The assistant manager suggested directing it to the store manager and leaving it in his office, but we decided against it. So I took Herman home. I do not think that he enjoyed the drive or my choice of music. I could hear him scampering around in his box the entire time. Either way, he made it home alive and my siblings took great delight in the little cutie. They even gave him some oats to eat, which is probably the healthiest thing Herman has ever tasted after living in a store whose only food supply is beef jerky and sugary delights. After the excitement died down, I instructed them to go to bed and to let Herman go. He was under no circumstance to stay within our house. I’m not really sure where the communication failed. 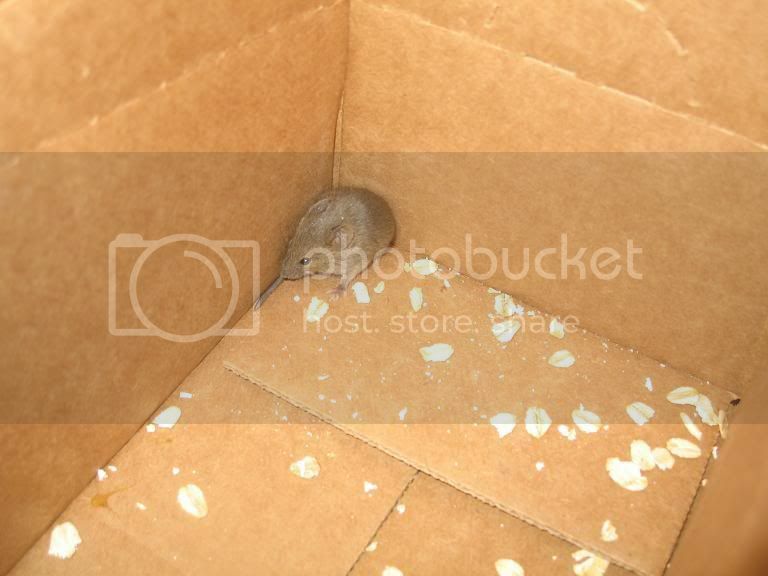 All I know is that the next morning, 7 year old Dippy came to me and said, "Um, I was petting the mouse down in the basement and, um, he got out of the box and I couldn’t catch him!" Lovely. My co-workers think it’s hilarious. We have mousetraps set everywhere downstairs but the little fellow is yet to be found. So if you are ever forced with the decision to flush a mouse down the toilet or take him home, flush him or offer him to someone else. Especially if you have little siblings. I told you I was braindead that day. eeek. I am one of those girls who does not like mice!!! When that word, phalanges, was typed, I immediately thought of some sort of fajita. I kid you not. I love you so much, Coie! 1) How old is your Bible? 2) Why did you choose this Bible? 3) Do you highlight/mark passages? 4) If so what is your system? 5) Do you have notebooks to record things? 6) If so how many and what do you record? 7) Where is your favourite spot to read your Bible? 8) Are there any special thoughts about your Bible you want to share?